A credible rendering of a fascinating period in history. Story blurb: Martin Archer’s “The Archers” saga is set in rough and dangerous medieval Britain. It’s a dull and brutal place which forces many Englishmen to go abroad and join the crusades to escape their fates and seek their fortunes. It is based upon the tales and histories in the newly discovered parchments found under some rubble in the basement of the Bodleian Library. The action packed books in “The English Archer” saga begin with “The Archer’s Quest.” It follows young man who joins a company of English archers when his older brother Thomas leaves the monastery to take him crusading with King Richard. Years later William himself is leading the company’s handful of survivors as they attempt to fight their way home past corrupt church officials and slave-taking Moslem pirates in a desperate effort to return to England. 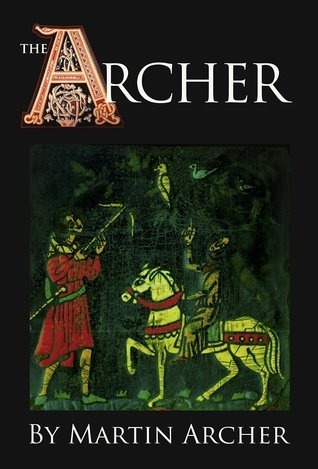 While The Archer: A novel of medieval England (The Archers #1) by Martin Archer is listed under ‘gay adventure’ on Amazon, it must be working with a different definition of ‘gay’ than I am. Nonetheless, I was drawn by the fact that it is primarily a male adventure set in the medieval era around the time of crusades (1095 – 1291), one of my favourite periods in history, and also features a company of yeoman archers – one of my favourite set of characters as well. The story takes the guise of a recently discovered chronicle that recalls the adventures of William, Captain of the English archers, as recorded by his friend and scribe Yoram of Damascus. The tales are many, but for the most part they capture the essence of the time fairly well. The crusades were an ill conceived, poorly organized, avaricious campaign that had little to do with Christ, and more to do with wealth and plunder. Nonetheless, as the author emphasizes, they were a relief from the drudgery of toiling thanklessly for the divine right of kings, noblemen and clergy. The fact that they were also a complete and utter disaster only adds to the literary possibilities. As far as I can tell, the author has done his homework regarding the grottiness of the period, and I am glad to see he didn’t try to gloss it over in Hollywood style. Life was truly nasty, brutish, and short for the burdened classes, and the avarice of the upper classes didn’t help alleviate the situation. That said, there are some editing issues, and at times the dialogue doesn’t fit the character – i.e. where the kid says “…My arse is sore.” Considering it is said in the presence of his uncle, a monk, the expression seems questionable. Product descriptions: Something I found off-putting about this book had nothing to do with the story itself; rather, it had to do with the business surrounding it. In my opinion, product descriptions (i.e. ‘blurbs’) should describe what readers can expect from the novel at hand – not all the other novels in an author’s repertoire. And while we’re on the topic, generally, I’ll decide if a novel is ‘exciting’ or ‘action-packed,’ so hyperbole is utterly wasted on me until I have read the story. For those of you who have requested a review. thank you for your interest, and my apologies for not responding to your request individually. I’m getting there, but the numbers have been overwhelming. Please extend your patience just a bit longer.Thanks again!